The Steridox-VP is a chlorine dioxide gas sterilizer designed for use in any pharmaceutical, manufacturing, laboratory, research or surgical setting. The Steridox-VP provides a rapid and highly effective method to sterilize medical devices, sterile products, instruments, and components at ambient temperatures. It utilizes a rugged industrial control system and the machine is constructed of robust, corrosion resistant 316L stainless steel to provide an exceptionally long life. The Steridox-VP features a sophisticated photometric sterilant concentration monitoring system allowing for a tightly controlled and consistent sterilization process. This repeatable, tight process control and accurate concentration monitoring system make chlorine dioxide gas sterilization cycles easy to validate. When sterilization cycles are completed, a run record is produced that contains cycle data including the date, cycle time, cycle steps, as well as temperature, pressure, and chlorine dioxide concentration. Run Data can also be electronically logged to the included USB drive. The control system features a password protected, recipe management system with historical and real time trending of cycle data. 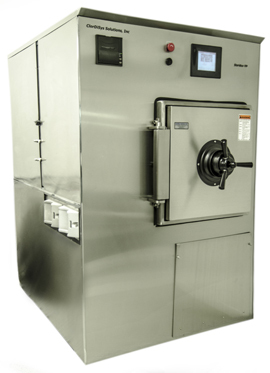 The Steridox-VP is available in a variety of sizes to meet your facility's processing needs and custom features are available upon request. All instrumentation, including the concentration monitoring system, can be easily calibrated to traceable standards. ClorDiSys' Steridox-VP features a sophisticated real-time chlorine dioxide gas concentration monitoring system to ensure a tightly controlled decontamination process. The Steridox-VP has to ability to sterilize items at either ambient or at vacuum pressures. The Steridox-VP utilizes a USB drive to keep track of all cycle parameters during a decontamination. This data can then be downloaded to any database software. A printed run record can also be provided with the included printer.